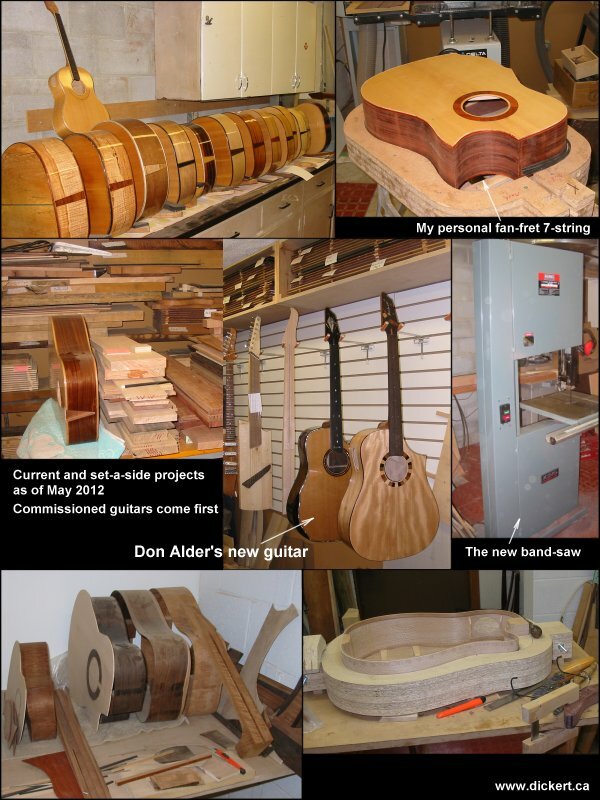 People sometimes ask me why I just don't finish one or two guitars at a time like most other builder? "I don't know... I have a short attention span?" "Sort off." But doing "set up" adjusting the tools and machinery tends to take longer than doing the actual work. So once set-up, I like to run off a number of copies, sets, part, whatever. I also like to see things "in the clamps" waiting for the glue to dry while I work on something else. Ok, it don't often happen that way, but as you can see, the guitars are starting to line up anyway. Plus I like the look of the collection. Then there is the fact of French Polishing. It takes a long time to do, and you can only do so much of it at a time on any one instrument. And that is the big reason for the back up and yes... I'll stick to that line for now. 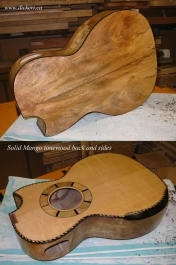 So, here is a list of projects and photos of instruments under way. Note; spec instruments get pushed to the back of the line so completions are not in number order. Any of the available instruments still have options for customization so if you see something you like, let me know and lets talk. 026 Acoustic FC-D Okoume Back, Sides and Top. 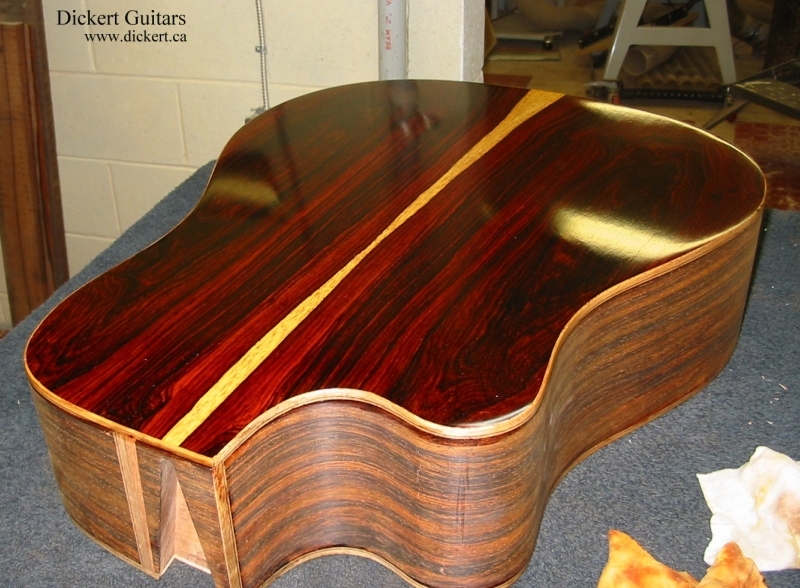 Honduras Mahogany neck with a Okoume laminate down the middle. 028 Acoustic FC-D Spalted Flame Maple back and sides, Sitka Spruce Top, Flame Maple neck with dual black pin lines. 029 Acoustic D-12 Spalted Flame Maple back and sides, Sitka Spruce Top, Flame Maple neck with dual black pin lines. Note: this is the sister guitar to the one above with all details identical. 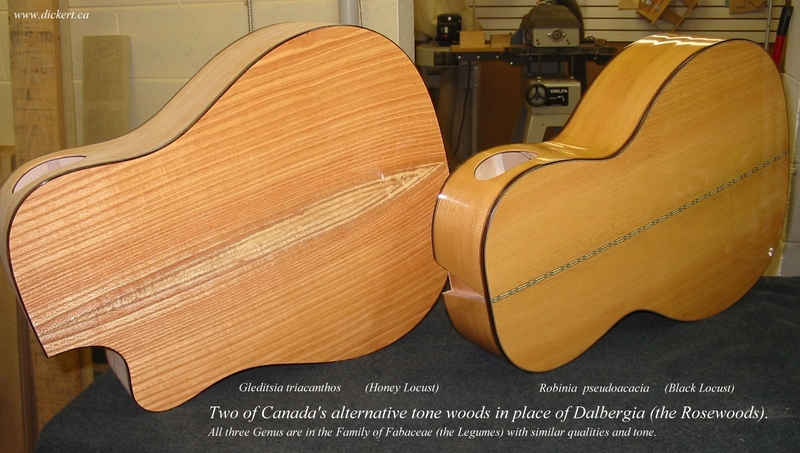 The backs and sides are cut from the same board with matching Spalt patterns and grain, the tops are cut from the same Sitka and have the same grain, the necks were cut from the same board and have matching flame patterns. I will want a lot of money for the pair. 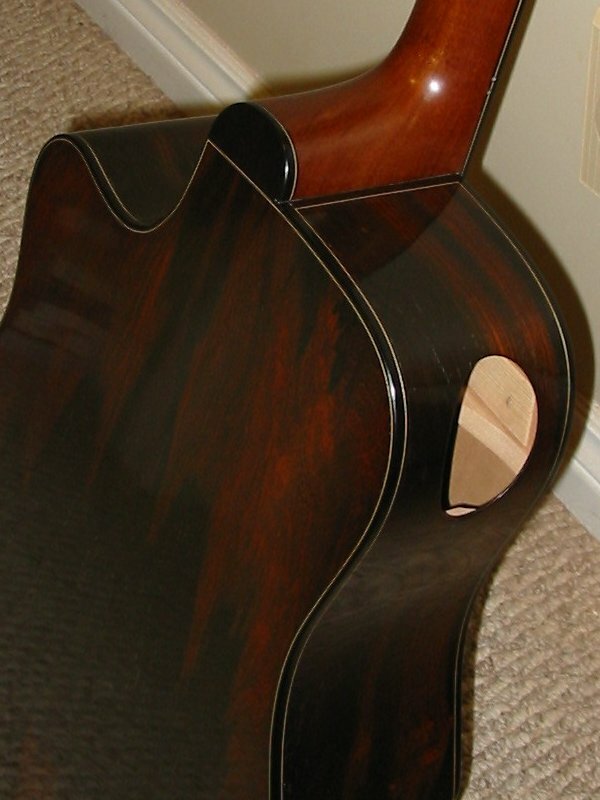 038 Acoustic Dreadnought V-cut Cocobolo back and sides, Sitka top, African Mahogany Neck, Ebony Fretboard.